After a massive forest fire covered Jerusalem in ash and caused residents to be evacuated on Wednesday, two more fires broke out Thursday in what many suspect is part of a series of arson attacks. 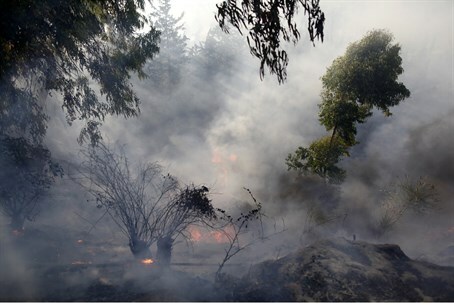 A blaze was discovered Thursday in the wadi (valley) between Har Hotzvim and and Golda Meir Boulevard in the north of Jerusalem. Traffic from the Golda Intersection to the French Hill Intersection in the northeast of the capital was closed to cars while firefighters dealt with the fire. Roughly the same time on Thursday afternoon, a fire broke out in a field of thorns right by the city of Karmiel in the Western Galilee, located in Israel's north. The fire occurred right by the Arab village of Nahf, located adjacent to the Jewish city. Also on Thursday, the Jerusalem Magistrates Court extended by four days the arrest of a 20-year-old Arab resident of Abu Ghosh to the east of Jerusalem, suspected of setting a forest in the area on fire Sunday. Police report that the suspect, who was arrested on Wednesday, confessed to committing the arson attack and re-enacted the incident for them. The two fires and arrest extension come a day after a major forest fire near Jerusalem's Ein Kerem neighborhood was finally contained, in firefighting efforts that extended into Wednesday night, and included six firefighting planes. Residents of three streets, as well as the Yad Vashem Holocaust Memorial Museum and Hadassah Hospital were evacuated due to the heavy smoke and encroaching flames, and all vehicle traffic near the blaze was closed. A total of twelve homes were damaged, several people suffered light injuries from smoke inhalation, and the light rail between Denia and Ein Kerem stations was shut down. Reportedly authorities were investigating whether arson was behind the blaze, while pursuing an alternative that negligence by hikers might have sparked the blaze. "Who is burning our country?" Former MK Michael Ben-Ari on Wednesday addressed the question of responsibility for the blaze, suggesting it was an act of terror given the unseasonable timing and recurrence of similar blazes every year. Writing on Facebook, Ben-Ari questioned "who is burning our country every year? Why isn't it spoken about? Who's hiding the nationalistic crime?" "Graffiti has been declared as terrorism, what about burning forests next to residential buildings? Is the Shabak (Israel Security Agency) investigating who is behind the fire terrorism, or are they busy with a girl who had chalk in her schoolbag?" asked Ben-Ari rhetorically. The statement about chalk would sound exaggerated, but indeed three girls were arrested in April on suspicion of writing "price tag" with rocks and sand on Muslim graves in Jerusalem, a case which the judge threw out of court. In another case, a woman was detained in May after the arrest of her teenage son allegedly went nowhere. Her son had been detained the previous week after he and another youth were found with markers and nails in their bags. Ben-Ari concluded his questions by saying "do you have the answers? I have an answer: the state of Israel is being conquered from within, and we're drugged on sleeping pills!" The 2010 Carmel fire near Haifa, considered one of Israel's worst and which killed 44 people, was suspected by police to have been started by two Arab youths from the Druze village of Usafia. Nevertheless, the criminal case against them was closed in 2011 over "insufficient evidence." State prosecutors stated there would be "severe legal and evidence problems" if the case was brought to trial due to the fact that the victims died several hours after the blaze was set, and at a significant distance from where the fire started.